Anyone looking for a new voice that's well-made, excels at high gain and stays impeccably in-tune should check this out. Alternative materials; tuning stability; pristine tones. Pricey; lack of UK availability; hardly vintage in tonality. Formed by brothers Franco and Paolo Turra and luthier Giovanni Tensi, Italy-based ThreeGuitars specialises in carbon fibre and aluminium alloy technologies. The Meta Salvo guitar reviewed here is the signature model of eclectic Satriani-esque Italian guitarist/ producer Salvo Correri and features a CNC-machined aluminium body and a 'tubular' carbon graphite neck bolted to the body via a patent pending 'Steady Lock' dual bolt fixing on a minimal heel. The Gotoh/Wilkinson vibrato and Seymour Duncan Custom/'59 humbuckers are more familiar; likewise the Sperzel tuners adorning the aluminium headstock. At just under 9lbs in weight it's not overly heavy and the workmanship is top quality. It's an extremely in-tune sounding guitar, precise, even and pristine. 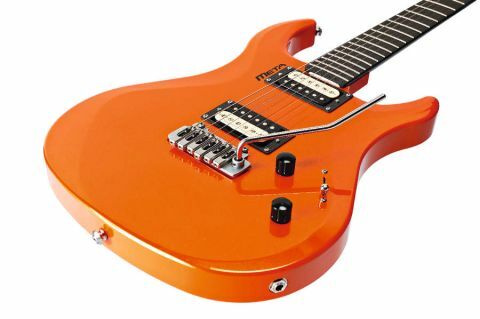 The five-way selector gives standard humbucking linkages, dual single-coils and neck single-coil and the tonal range is good. There's a very defined separation which makes high-gain clearly audible, only the bridge 'bucker can sound a tad shrill with older-style lower gains. Certainly not vintage or woody, it's much more modern sounding and excels at clean funk chops contrasted by inspiring high-gained textures. The fingerboard edges could be less sharp and the frets feel tall, but it's a guitar that grows on you.